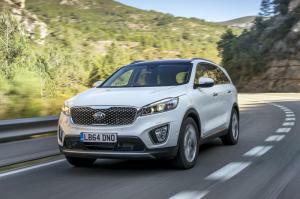 The new Kia Sorento is on sale in the UK now, with prices starting from £28,795. 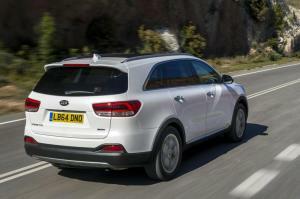 All models are powered by a 2.2-litre turbodiesel which meets Euro 6 emissions regulations. It produces 197bhp and 441Nm of torque, both figures up marginally over those of the old model. Just over half a second has been shaved off the 0-62mph time, now down to 9.0 seconds dead, while top speed is 124mph. It’s available with both manual and automatic transmissions, with manual models recording up to 49.6mpg on the combined cycle and CO2 emissions of 149 g/km. Four-wheel-drive is provided by Kia’s Dynamax electronically-controlled system: in normal driving, it directs 100% of engine torque to the front wheels for economy, but can redirect up to 40% to the rear wheels to increase cornering stability or to deal with reduced traction. A manually-selectable lock mode can be engaged for off-road use, and this provides a 50:50 split for speeds of up to 25mph. Coupled with this are a variety of electronic systems such as Advanced Traction Cornering Control (ATCC) which applies the brakes to spinning wheels to redirect torque to the opposite wheel, plus systems such as Hill-start Assist Control, Trailer Stability Assist, and others. Kia says steering feedback has been improved thanks to the relocation of the steering assistance motor to the rack itself, instead of being mounted remotely on the column. Also said to be improved are refinement levels, with a stiffer body structure and increased use of sound insulation materials throughout the car, particularly around the wheel-arches and transmission tunnel, as well as behind the dashboard. Four trim levels are available, starting with the KX-1. 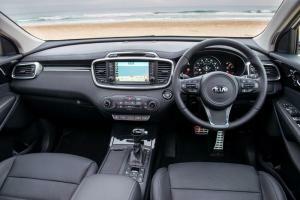 As standard, it features seven seats, 17-inch alloy wheels, a cornering function for the front fog-lights, wiper de-icers, electrically adjustable heated door mirrors, all round electric windows, cruise control and air conditioning. KX-2 models add automatic lights and wipers, heated leather seats, dual-zone climate control, seven-inch touch-screen navigation, reversing camera and self-levelling suspension. KX-3 models gain a panoramic sunroof, adaptive xenon headlights, eight-inch touch-screen, eight-way electric driver’s seat, keyless entry, powered tailgate, TFT instruments, plus Lane Departure Warning and Speed Limit info. The range-topping KX-4 upgrades that further with a 10-way power-adjustable driver’s seat, eight-way front passenger seat (both of which are ventilated), adaptive cruise control, 360-degree Around View monitor, Smart Park Assist, Blind Spot Detection and Rear Cross Traffic Alert. Sounds pretty comprehensive to us.